What does Google’s new mobile-first indexing mean for my business? Is it necessary to create a separate website for smart phones? How do you attract more Google searchers from mobile devices? Starting now, Google will be indexing content on the mobile version of a website first. Its ranking algorithms will focus on how well the mobile websites are designed and optimized. Google will continue to index desktop versions, but businesses that have ignored mobile devices will soon see rankings drop dramatically. The process will take some time, but this new indexing strategy is expanding quickly. There’s no time to waste in planning for these changes. Companies that have been comprehensively adapting to the increase use of smart phones and tablets will see the least impact. However, outdated websites will see their search traffic from Google decline steadily. Many companies have created separate websites that are for mobile devices only. Visitors who use smart phones are automatically redirected to these miniture websites. Typically, such slimmed-down websites have been created with less content, fewer pages, and more graphical elements. Before Google shifted to indexing mobile websites, the rankings of a website were based on how well the desktop version of the website was designed and optimized. Now that Google will index the dedicated mobile sites first, ranking algorithms will not get enough information from those outdated miniture mobile websites. As a result, rankings can drop, leading to lower visitor traffic. At our Twin Cities web design, SEO and neuromarketing company, we have been designing mobile-responsive websites preferred by Google. Our top-notch mobile SEO keeps our client websites ahead of their competition. For companies that already have responsive websites, Google will continue to index those, since they are mobile-ready. This will give such websites a leg up on dedicated mobile websites. With more relevant content, navigation schemes already tailored for mobile browsers and flexible design elements that adapt to different display resolutions, responsive designs will need minimal or no changes for solid mobile SEO. If they already earn high Google rankings for a broad range of popular keywords and phrases, they’ll maintain those rankings. As websites that aren’t optimized for mobile devices drop in the rankings, responsive websites should enjoy higher rankings. Our constant research and anticipation of Google’s changes gives our clients the edge. Older websites designed using template-based methods will not be seen by Google as mobile-friendly. If your website is 5 years old and has never been updated, chances are that it needs mobile search engine optimizatioin. Google will detect designs that do not appear properly on mobile devices or that produce a poor user experience. With Google’s strong demand for mobile SEO, such designs are certain to suffer in ranking. A complete revamp is the only way to regain good rankings. As the rollout of mobile-first indexing continues, many companies with outdated websites are likely to experience dramatically reduced search traffic from Google. That will automatically reduce new leads and sales. We advise prompt evaluation and revamps of those websites to avoid potential business declines for affected companies. Most business owners have only a vague concept of how Google ranks websites. Frankly, most web designers don’t know much more. Web design is a crucial part of SEO that has been ignored by many for far too long. Mobile-first indexing will change how Google extracts information from websites. It will also significantly change the fundamental ways that search engine ranks websites. The process is highly automated and uses artificial intelligence techniques. Increasingly sophisticated ranking algorithms evaluate over 200 factors. At our highly-rated web design, SEO and neuro-marketing firm in the Twin Cities, we’re constantly following the latest developments from Google. We’ve been doing that since the search engine was launched. Everything we do is designed to produce top rankings for our clients. Is your company’s website optimized for Google’s mobile ranking algorithms? We can help you find out. We’ll be happy to check it for you at no charge. Just contact us with your URL address. We’ll check to see if it’s mobile-friendly and whether its design is optimized for this new indexing and ranking. We’ll also look at it from an SEO perspective to discover whether it’s getting optimal rankings. We’ll let you know what we find. If we think it needs improvement or isn’t mobile-ready, we’ll tell you that, too. We’ll discuss ways we can help and give you options and price information to consider. There’s no obligation or charge for this analysis and consultation. 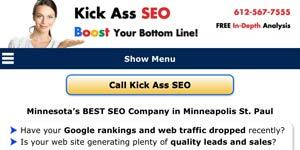 We want you to succeed with your internet marketing strategies. Ask us for examples of our success stories. Contact us soon to get started.